I’ll bet most of you know how this works. So often, when you go out into your garden, you see everything that needs to be done instead of everything you’ve accomplished. You spot the stray weeds while overlooking the beautiful foliage. You see the plant you really need to move rather than soaking in the beauty of your overall garden landscape. It’s easy to get caught up in our to-do lists, while overlooking our well-done lists. Today, I was cleaning up sticks in my front garden in the wake of a crazy wind storm the previous evening. A lady came by walking her dachshund. She saw me cleaning up and commented, “You work so hard, and then nature undoes everything.” I said that the damage wasn’t just so bad, and that at least none of my plants seemed to have suffered more than a broken frond or two. We got to talking a bit more and she said, “I’ve been walking by here for a few years now, and every time I see your yard I think to myself, ‘She’s really made this beautiful. '” I thanked her, and she went on to tell me that she waits for my garden to come up every spring so she can admire it. Obviously, her comments made my day. I’m always looking at other gardens, which are many times better than my own, and admiring other people’s handiwork. My garden always seems to be lacking (and often severely) by comparison. Rarely do I take the time to appreciate what I’ve done, and all I’ve accomplished. All it took was one lady with a dachshund to remind me that I need to do that more often. So, my gardening friends, appreciate your gardens! Let’s consider today Garden Appreciation Day. What do you appreciate about the gardens your hands have helped create? There are plenty of beautiful plants that will grow in average to moist shady areas, but dry shade can be tough. And finding a pretty flowering perennial that will tolerate dry shade is even tougher. The drought of 2012 here in the upper Midwest tested even the sturdiest plants, and this year I’ve learned which ones are the true survivors in my garden. The plants I’m listing below not only tackled the drought last year with barely any supplemental watering from me (thanks to city watering restrictions), but came back this year none the worse for wear. I heartily recommend them for your dry, shady spots. These perennials can be difficult to come by, and occasionally expensive as a result, but it’s worth the effort to track them down. Not only will epimediums dazzle you with dainty, dangling, fairy-like flowers in early spring, but they’ll provide attractive foliage all season long, and most varieties put on a great show of fall color. The flowers of epimediums are generally small, and it can take a gardener’s eye to appreciate them because of the way they’re tucked into the plant’s foliage, but I love them because they’re not ostentatious and, when I go looking for them amidst the spring growth, they feel like my special little secret. The first thing I do every spring, as the snow is finally melting, is to go out and look for the hellebores. These sturdy plants seem like they’ll survive anything, and they never fail to impress me by blooming earlier than even the crocuses and daffodils (hence the common name, Lenten rose). Hellebores are gaining in popularity, and there are some spectacular new colors and double-blooming varieties coming on the scene regularly. My own are of the plain, single variety–as sturdy as they come. But check out the image from my garden (below) and you’ll see that they’re really anything but plain. 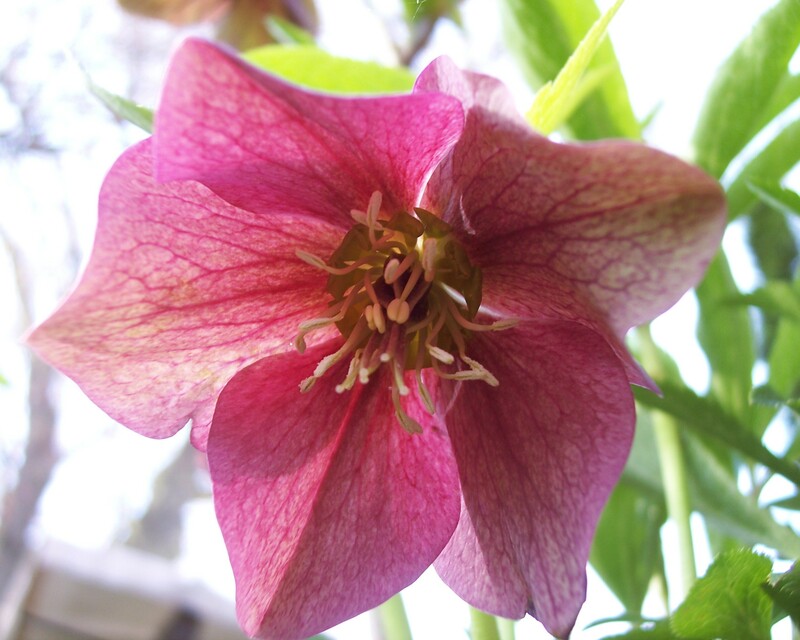 My hellebores always draw comments from people wondering what that pretty, early-blooming flower is. Nothing “plain” about this pretty single bloom. 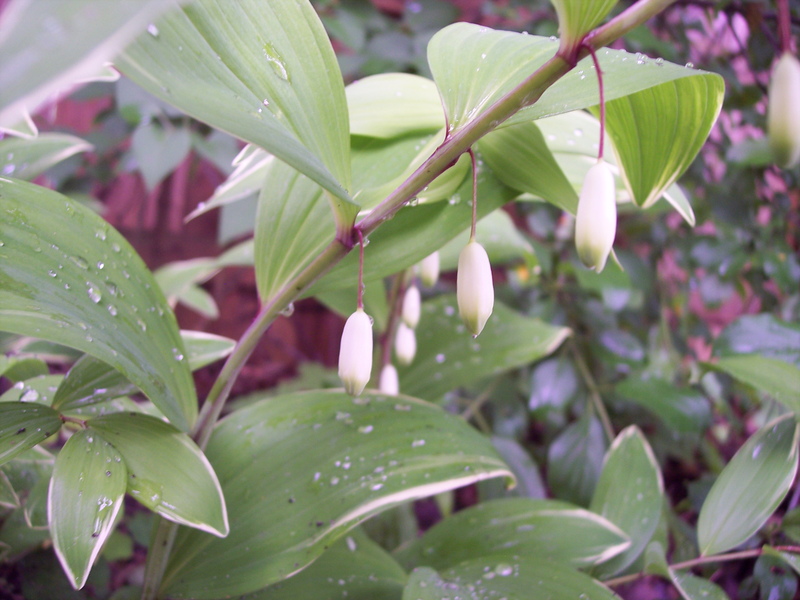 Okay, I’m cheating a bit here–Solomon’s seal isn’t what you’d call a “flowering perennial.” Although it does have a bloom, it’s more of a little white teardrop that’s barely noticeable. Still, it has spectacular foliage, a graceful habit, and it tolerates dry shade like nothing else. 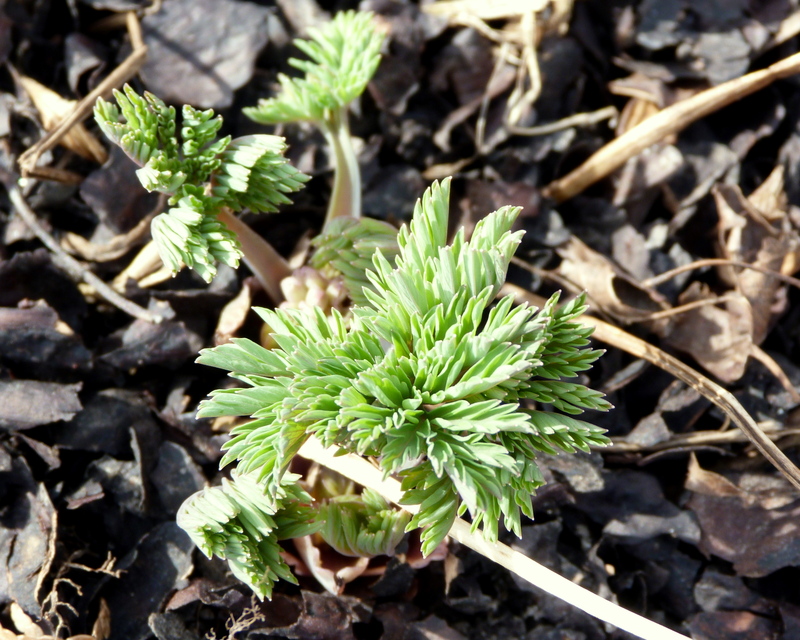 In late April or so, you’ll begin to see the pips of each individual frond poke out of the soil. 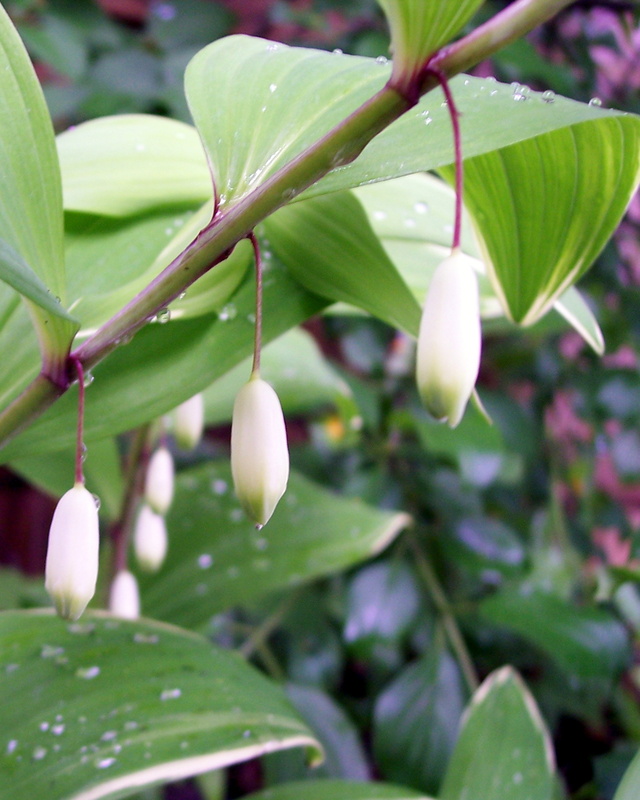 Over time, Solomon’s seal will spread to blanket a shady area. (It’s not the least bit aggressive, though. In fact, I wish it would spread a little faster.) I wouldn’t garden in the shade without it. The flowers aren’t showy, but the plant itself is. This little woodland flower is an ephemeral, meaning that it shows up in the spring and disappears with the heat of summer. But, while they last, trilliums put on a lovely show. Like Solomon’s seal, they’ll spread slowly in woodland soil to form a nice patch of flowering spring beauty. (Fun fact: Trillium seeds are spread by ants.) In some states, trilliums (a native wildflower) are protected. In any case, picking them or harvesting them from the wild is damaging. When you pick a trillium, which removes the leaves from the stem, you’re taking away the plant’s ability to produce food to sustain its continued growth. When you harvest them, you diminish the already small population of wild plants. So, leave them alone and get them from a grower who does not harvest wild plants. A trillium in my garden. They’re so named for the three leaves that form just below the bloom. Gardening in dry shade does sometimes mean that you have to dial down your expectations when it comes to showy blooms and learn to appreciate the subtle beauty of woodland species and ephemerals. I’m a big believer in any plant that can tolerate shady, dry conditions, and return again with enthusiasm the following spring. Take some time to track down these shade-loving beauties–you won’t be disappointed! I fumed and muttered that my son should know better. Walking in the garden has always been taboo around here, and there are some good reasons why. Take a look at the photo above. 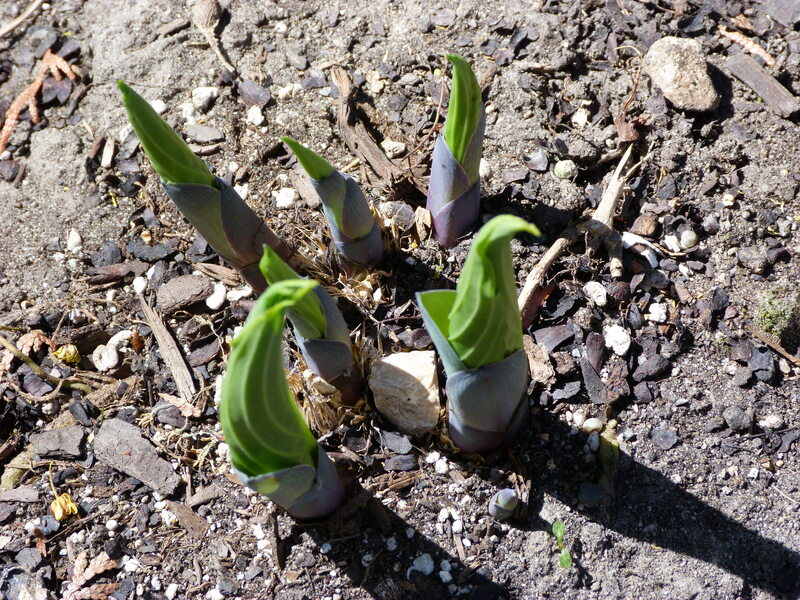 That’s an emerging hosta in my garden. The little pointy things are what many hosta people refer to as pips. Each pip is made up of several tightly-wrapped sets of leaves that will unfurl as the season progresses. In my photo, the pips are well above ground and fairly easy to avoid. Early on, though, the pips can be right at the soil line or still hidden under mulch. 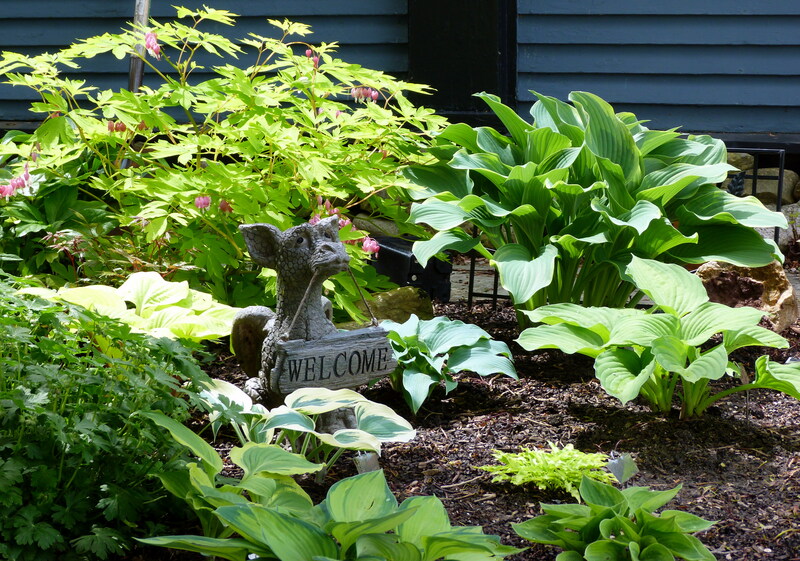 The problem with walking in the hosta garden is that accidentally stepping on an emerging hosta can have negative consequences, especially if perfect leaves are your goal. (And really, why wouldn’t they be? 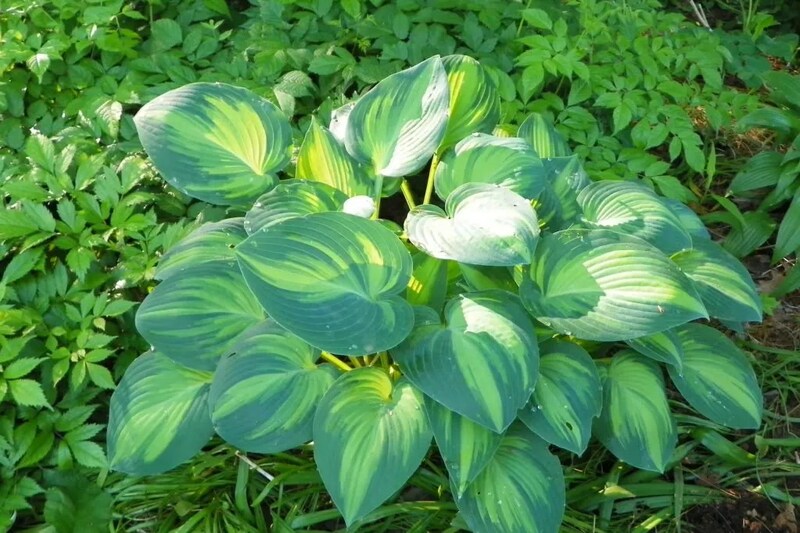 Hostas are all about leaves.) Bending or crushing the pip often tears the emerging leaves before they even unfurl, leaving them looking tattered. The photo above shows leaf damage to a hosta that’s been accidentally stepped on while emerging. It’s frustrating to see hostas that you’ve been waiting for all season unfurl with damaged leaves. Lots of other things, from slugs to hail to foliar nematodes, can cause damage to hosta leaves, but stepped-on damage is easily preventable–just don’t stomp around in your hosta garden (or at least step very carefully), and try to keep others out of it. I did let my son and his girlfriend get away with their trespassing mostly unscathed. The only consequences they suffered were the Mom Look of Death ™ and a boring lecture on the anatomy of a hosta pip. Hopefully they understand now why stepping in my garden is verboten. Let me preface something: for a hosta collector, picking the “best hostas” is like picking your favorite child–impossible. And yet, here I am trying to do the impossible and provide lists of some can’t-miss hostas that every garden with at least part shade needs. For part one of this article series, I’m focusing on a few classic varieties that have been gracing hosta gardens for a decade or more and have established themselves as winners. My list is by no means the definitive list and, of course, it’s all subjective. But I’ve based my picks on hostas that I grow myself, as well as recommendations from many a hosta grower. 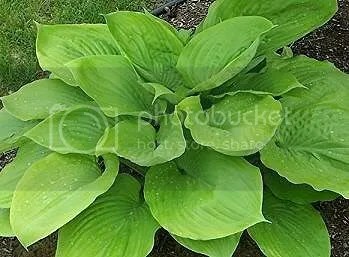 If you want to know what the majority of hosta lovers view as some of the best around, the American Hosta Society publishes an annual list of the most popular hostas based on member votes. Some of my picks match those on the current AHS list of favorites. (You’ll note that the AHS vote always tends to swing toward the flashy variegated hostas we all love, but there are some great solid-colored classics, too.) All of these, in my opinion, are garden rock stars. H. ‘June’ grown in a shady spot. Lovely! I bought ‘Regal Splendor’ three years ago when I saw it sitting on a clearance shelf at a local nursery. It wasn’t overly impressive when I first planted it, but most hostas take two or three seasons (or more for the bigger varieties) to really start showing off. The following season, ‘Regal Splendor’ doubled its size, and then I was impressed. The season after that, it doubled its (already doubled) size yet again, and I was blown away. This large vase-shaped steely-blue-green beauty with yellow edge variegation and slightly wavy leaves won me over in a big way. 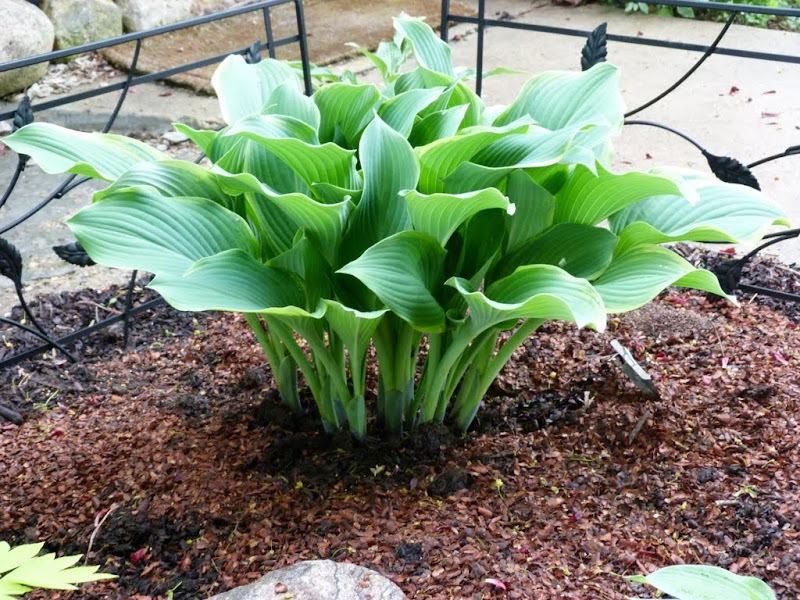 Make sure to give this large hosta plenty of room to spread out. Here’s H. ‘Regal Splendor’ the year I planted it. And here’s ‘Regal Splendor’ emerging in the spring one year later, and double its size. As I mentioned above, ‘Halcyon’ is the parent plant that produced ‘June,’ its popular offshoot (or sport.) But ‘Halcyon’ stands on its own merit as a beautiful medium-sized blue hosta with great form and substance. Every hosta garden needs attractive, solid-colored plants to serve as a calming backdrop, and ‘Halcyon’ fills that role perfectly. H. ‘Halcyon’ has great form and substance. Give it a good bit of shade to help maintain its pretty blue color. 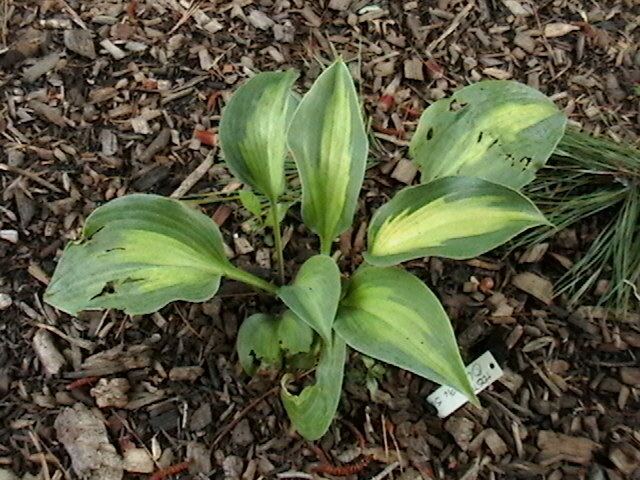 This hosta tops the 2011 American Hosta Society popularity poll for a reason. I won a giant division at a local hosta society auction a few years ago, and it’s been the standout in my garden that everybody comments on. ‘Sagae’ is a very large hosta, and anyone purchasing a young plant should understand that it’s going to take some time for this beauty to reach maturity. Hosta ‘Sagae’ in my garden as a newly-planted auction win. Most large hostas will take several years to reach this size, but they’re worth the wait. The name of this variety says it all, doesn’t it? ‘Sum and Substance’ is another big boy–in the Very Large category, like ‘Sagae.’ And like other giant hostas, it takes some time to come to size, but when it does it’s definitely got a wow factor with its gigantic chartreuse leaves. This variety is fairly sun tolerant (given enough moisture), and the color will brighten up the more light you give it. ‘Sum and Substance’ is a big guy! 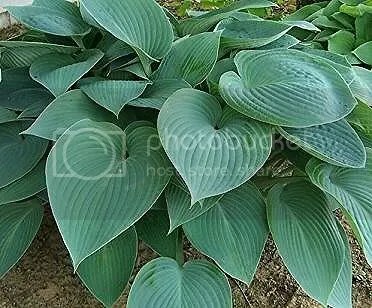 Are there any classic hostas (introduced a decade or more ago) that you’d like to recommend? Post them in the comments. 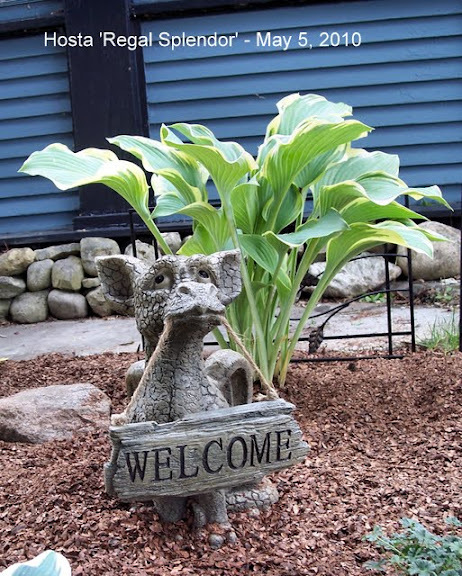 And stay tuned for more lists of must-have hostas in future articles! I used to spend lots of money at nurseries every gardening season. Let’s face it–a good nursery brings any gardener joy. 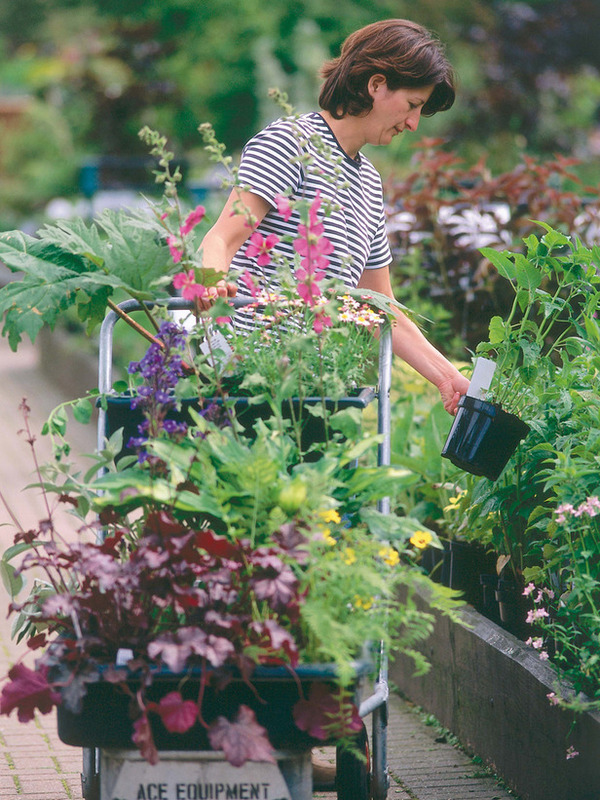 To a gardener, strolling through a selection of perennials, gleefully picking out new additions, is akin to a shopoholic hitting Chicago’s Magnificent Mile or perhaps even Rodeo Drive. But the problem is: shopping on the Magnificent Mile or Rodeo Drive isn’t cheap. Sure, you’ll find swanky designer fashions, but you’ll pay the price, too. And you’re likely to come home with a lot less swag than if you’d hit up the local outlet mall, instead. Regardless, I love a good nursery, and I have to make annual pilgrimages to my favorites every spring just because. But I spend a whole lot less at the nurseries now than I used to, because I’ve discovered how to get designer plants at outlet mall prices. Here are my best tips. I love Craigslist. Sure, there’s a seedier side to the free-for-all classifieds site, but most of the spamming, scamming and other unseemly stuff that you need to be savvy about isn’t happening in the “farm+garden” section. 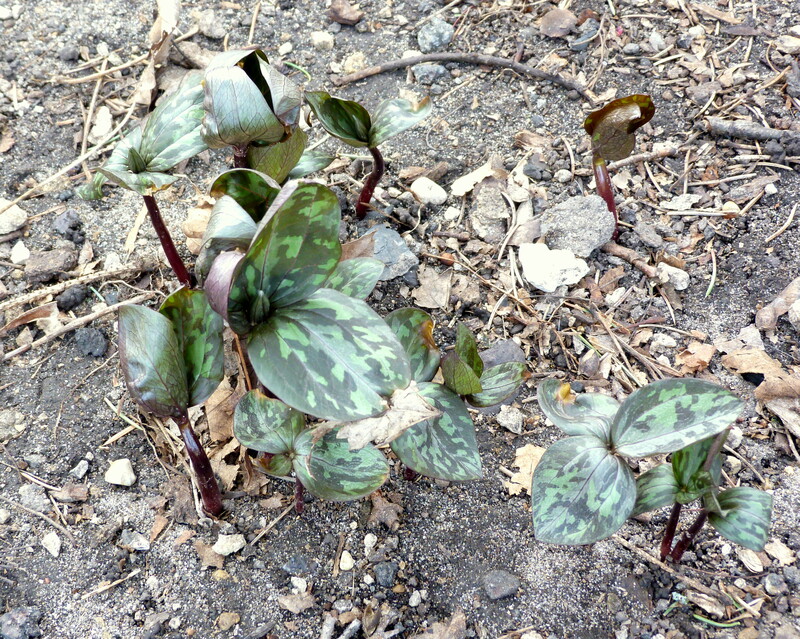 Simply hitting up Craigslist and searching using terms like “perennials” (or a specific plant, such as “hostas” or “daylilies”) will almost always yield some great results throughout the growing season, and particularly in the spring and, to a lesser degree, the fall when gardeners are busy dividing overgrown plants. Since most gardeners sell their divisions for under $5 (unless they’re very large or rare divisions) and most nurseries sell their stock for at least double, and often triple, that (at least here where I live), the savings is pretty obvious. And here’s another great tip for Android and iPhone users–download the Craigslist app! All you need do once you have the app installed is add your location (usually an area surrounding a major city) and your individual search terms and the Craigslist app will deliver notifications to your phone as they’re posted. You can even email advertisers through the app. It’s my favorite tool and, best of all, it’s free! Here’s a quick etiquette tip for Freecyclers: If you make an appointment to pick something up, be courteous and show up when you say you’re going to. Most people use Freecycle simply because they want whatever they’re giving away gone quickly and conveniently–that’s why their giving it away as opposed to trying to sell it. Members who promise to pick up an item and then don’t show are frowned upon for obvious reasons. Likewise, if you’re giving something away, don’t delete any emails from people wanting your item. If the first party doesn’t show (a pox upon them! ), you can move to the next. Funny how some people overlook the obvious choice. Farm markets aren’t only about fresh produce (although the fresh produce in itself is a great reason to go to them), there are usually lots of folks selling perennials, too. And, once again, you’ll find their prices are well below nursery prices. I’ve found one big bonus to shopping at farm markets–I can find plants that nurseries just don’t stock. 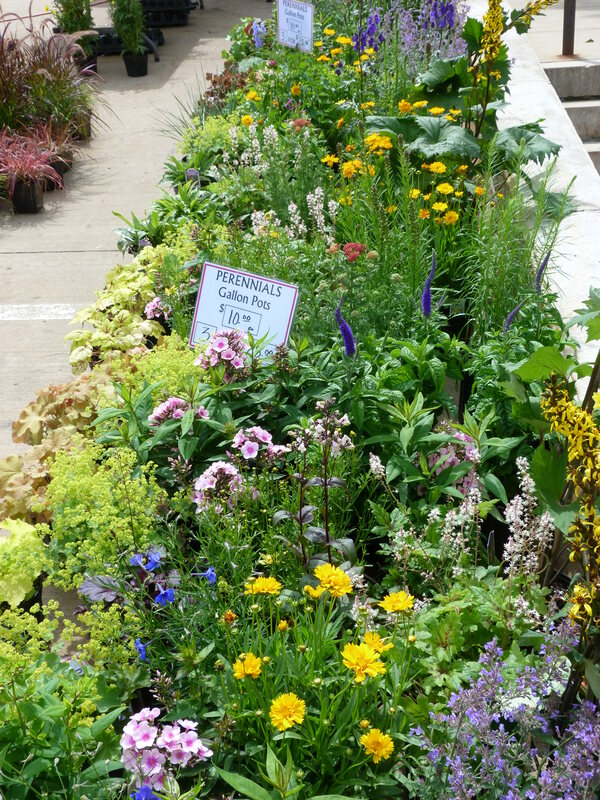 Most perennial nurseries stock only the most sought-after plants and varieties, sometimes regardless of whether they do well in the local area. And who can blame them? What’s popular is what sells. But growers at farm markets are selling the stuff that grows in their own backyards, so you’ll often find cool native perennials and wildflowers, interesting woodland plants and more. And rarely will you ever encounter something that’s iffy for growing in your climate. You’ll get a lot of mileage for your dollar. Wholesale growers sell the small plants that supply the nurseries you usually buy from. Nurseries may put a year of growth on some of those plants (called liners) before reselling them. But often they just pot them up into a bigger pot to give the plant room to stretch its legs and put them out for sale the same year. If you’re willing to start those liner-sized plants in your garden, and perhaps wait until next season before you see blooms on some of them, you can save serious cash. You’re more likely to find newer cultivars and hard to find plants in co-op sales than in any of the previous cheap gardening solutions I’ve mentioned. If you’re a collector of a certain kind of perennial–from brugmansias to echinaceas to hostas to lilies–co-ops are a good place to look for those extra special new designer varieties. You’ll find the tried-and-true varieties, too, which is a great bonus. You’ll find individuals who organize co-op sales on several different sites. One of the coolest ones I’ve encountered recently is Mamajack’s Co-ops on Cubits.org. Also check out Bulb and Plant Co-op Buying on YahooGroups (although I’ve heard mixed reviews on this one and haven’t actually tried it myself.). There are certain rules involved with co-op buying so make sure you read each group’s directions and information before you dive in. And, as a rule, you’ll want to work only with established co-op groups. Keep an eye on the group before buying to see what members are saying about the process. If you’re seeing complaints, walk away. Often times, you’ll be counting on an individual organizer to collect your money and ship your plants (although some growers will ship directly). You want to feel confident that the organizer has a good track record. Diane’s Seeds is a great place for perennial seeds as well as an excellent resource for information on growing them. Tom Clothier’s Garden Walk and Talk provides a wealth of information on seed germination. (Until you’ve had some practice starting from seed, you’ll want to stay away from the seeds that are finicky about germination conditions.) There are plenty of other seed sources and resources, but those are a couple of my favorites. I love nurseries, really I do. My year wouldn’t be complete without a visit to a couple of my favorites, and I still find it hard to drive by a garden center without stopping. But times are tough, money’s tight, and we gardeners have to find ways to cultivate (pun intended) our passion without breaking the bank. I hope I’ve offered up some helpful suggestions for building a Rodeo Drive garden on an outlet mall budget. Good luck and happy gardening! It’s been a cold, bleak spring here in Wisconsin so far. Nature just wouldn’t give an inch, preferring to keep us consistently chilly with temperatures in the 40s–quite a bit cooler than our average temps for this time of year. But this past weekend saw an amazing warm spell with more temperate highs in the 60s one day, and unseasonably warm 80s the next. And that was all it took to wake up the sleeping garden. I won’t ramble on about the joys of seeing the first growth in the garden each spring. Instead, I’ll share a few photos of what’s popping up here in zone 5. 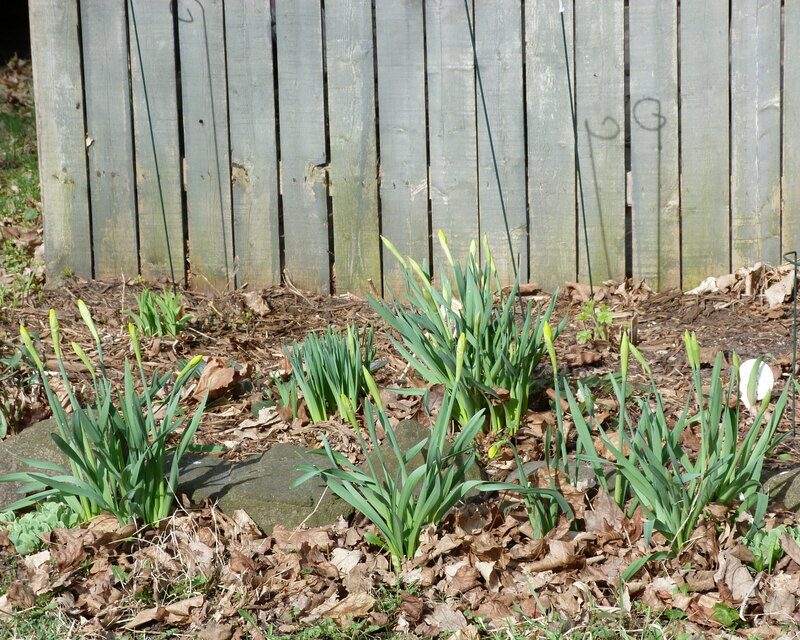 The daffodils in my front bed along the fence line are just getting ready to bloom. 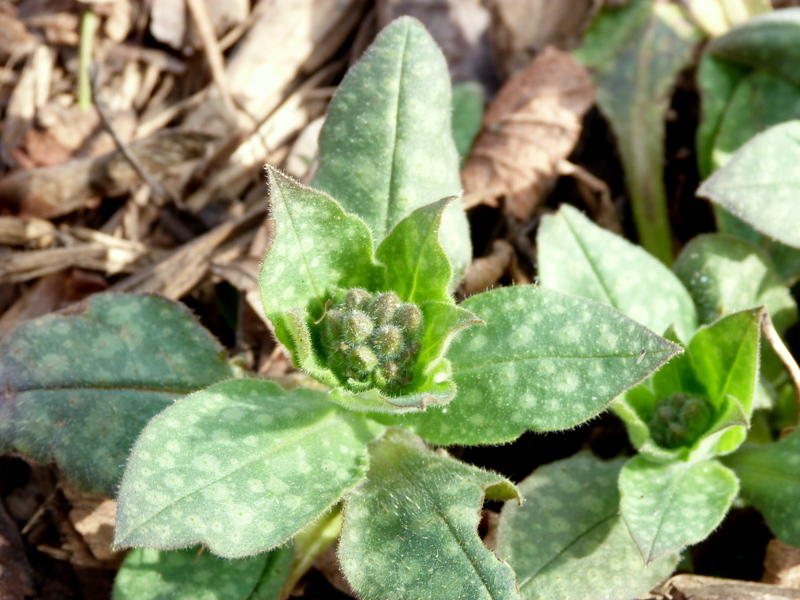 Pulmonaria (lungwort) has buds, and will grow and flower like crazy soon. 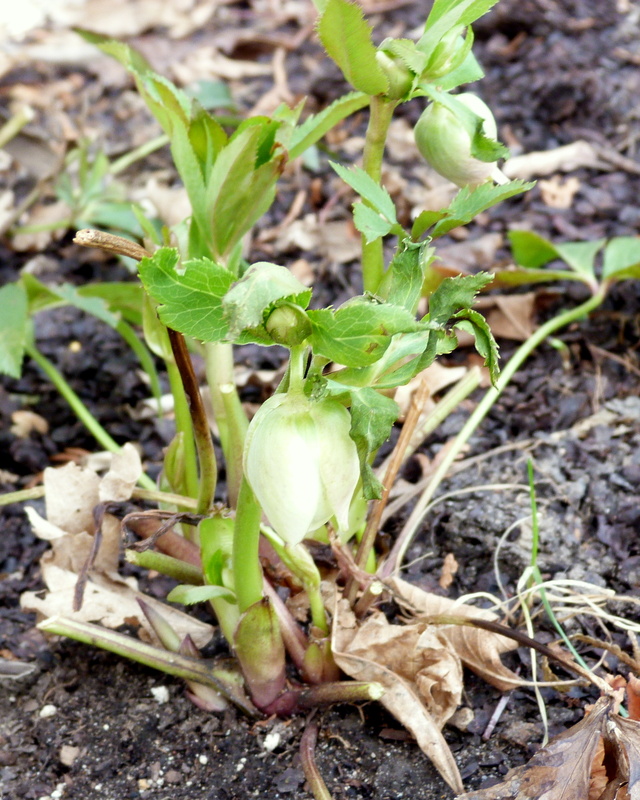 Helleborus will be leafy and covered in big nodding blooms in a few weeks. Dicentra exminia 'Burning Hearts' is off and running with ferny foliage. 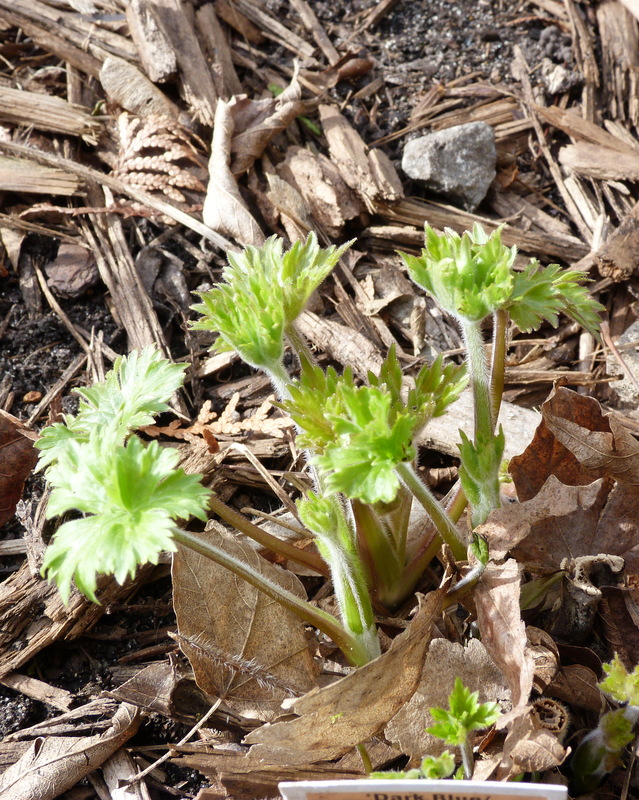 My favorite, Delphinium elatum, is just starting to grow. 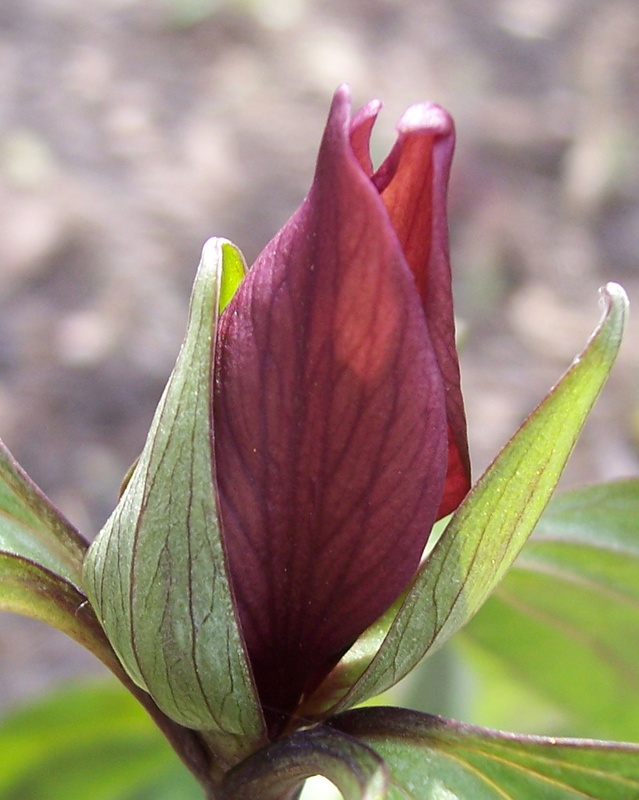 Soon, each tri-leafed trillium will be topped by a deep red flower. Anyone who finds it strange to be marveling over plants that are just in their early stages of growth–plants that won’t come into their full glory until they flower weeks, or even months, from now–hasn’t really gardened. Spring serves as a constant reminder to me that life constantly recreates itself, and that what appears to fade and die in the winter is simply dormant, waiting to be reborn. When I moved to my new home in September 2008 the leaves were changing and the fall color was glorious. I was so busy looking at the beautiful mature trees in my yard, including several maples that seemed to glow in shades of amber and red and orange, that I didn’t stop to think about the new challenge I had inherited–gardening in the shade. I’ve learned just enough to be dangerous since then, and I thought I’d share some of my favorite plants so far. Keep in mind that there are lots of woodland and shade plants for all different climates, soil types, moisture levels and sunlight conditions. The plants I’ve listed here are growing in my zone 5 garden in sandy loam beneath the shade of some large maples. They get a few hours of filtered sunlight and no direct sunlight. In deep shade (such as I have) dicentras will grow readily but won’t flower as well as those that get a few hours of sunlight (especially morning sunlight.) Dicentras spectabilis tends to go dormant in the heat of summer, so don’t plant it in a spot where it will leave a gaping hole in the garden come July. I’ve had good luck keeping my dicentras leafed out all season by cutting the plant back by half in June after it finishes flowering and keeping it moist. In fact, of the plants I’ve listed here, Dicentra seems to require the most moisture to thrive. It is by no means needy, but giving it a good, deep watering during dry spells will keep it looking its best. 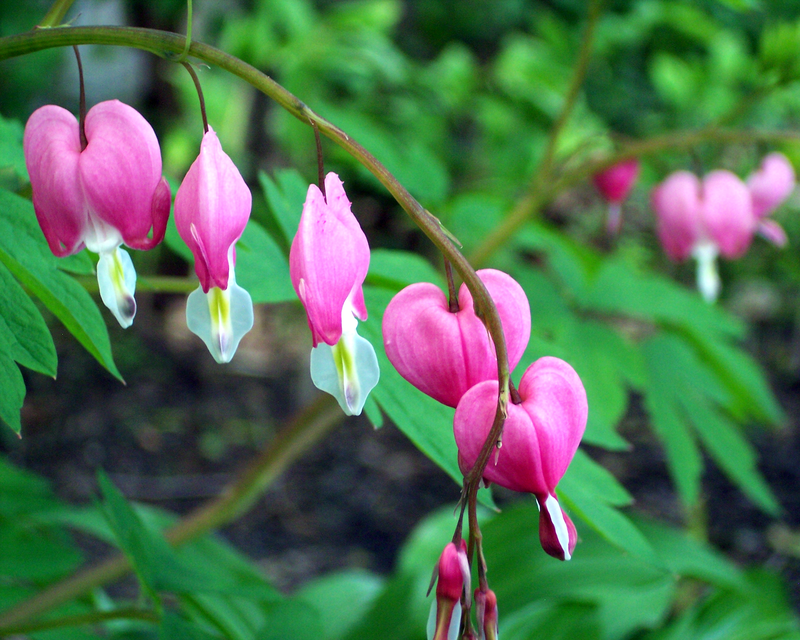 For an extra shot of color in the garden, give the newer cultivar Dicentra spectabilis ‘Gold Heart’ a try. It’s grandma’s bleeding heart plant, except with gorgeous gold to chartreuse foliage that glows in the shade and contrasts spectacularly with its deep pink flowers. If you want a lower growing flowering dicentra for a somewhat sunnier spot, give Dicentra eximia (fern-leaf bleeding heart) a try. Try cultivars such as ‘Luxuriant,’ ‘King of Hearts’ and ‘Burning Hearts.’ I have ‘Burning Hearts’ in fairly heavy shade in my front garden where it gets just a couple hours of sunlight and although it blooms rather sparsely it has lovely, ferny foliage that stays all season. A couple of years ago when I was first pondering what to put in my dry shade garden someone on the Dave’s Garden forum said, “You must have variegated Solomon’s Seal!” And he was right–this plant is one I’m glad I brought into my yard and wouldn’t want to live without. 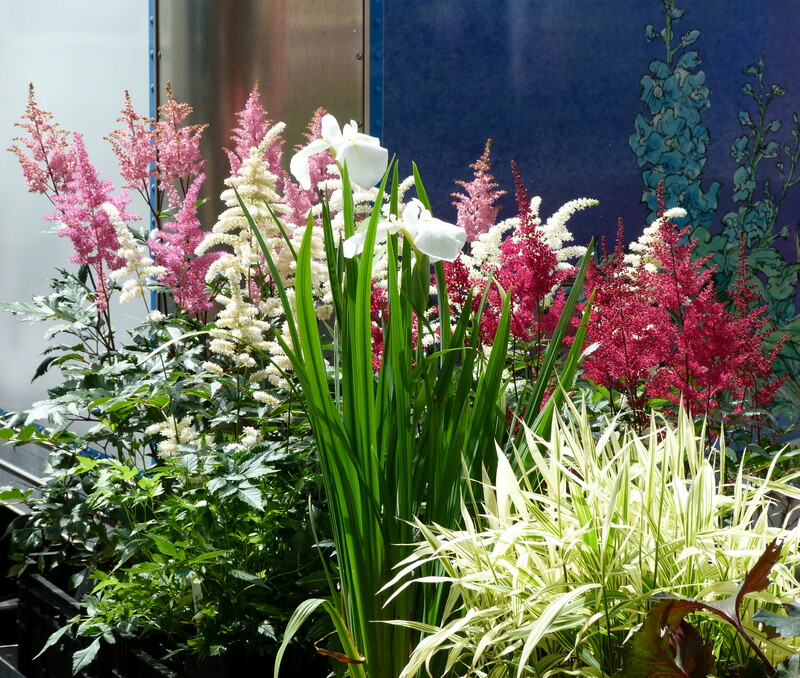 Its graceful arching stems and subtle coloring brighten a shady area. The unique raindrop-shaped white flowers are a bonus. If you know some shade gardeners you’ll probably find one willing to share some divisions of Solomon’s seal. It travels well bare-root and wrapped in wet newspaper. In the driest of dry shade, which is what I’ve got, I’ve found that it spreads very slowly, so if you’re planning on Solomon’s seal as a ground cover be sure to buy enough plants or you’ll be waiting quite a while to achieve the affect you’re after. Spring would not be complete for me without pulmonaria. The plant I grow is Pulmonaria saccharata ‘Mrs. Moon,’ and it’s one of my all time favorites for achieving a glorious show of flowers in shade. There are quite a few different species and cultivars of this plant, and all of them have their merits. Some are lower growing and smaller. Most have spotted or silvery foliage that tends to last all season and look attractive even after the plant has finished flowering. And flowering is what Pulmonaria does best. ‘Mrs. Moon’ is full on flower factory, producing masses of amazing little flowers that start off with a blueish tint turning to pink. 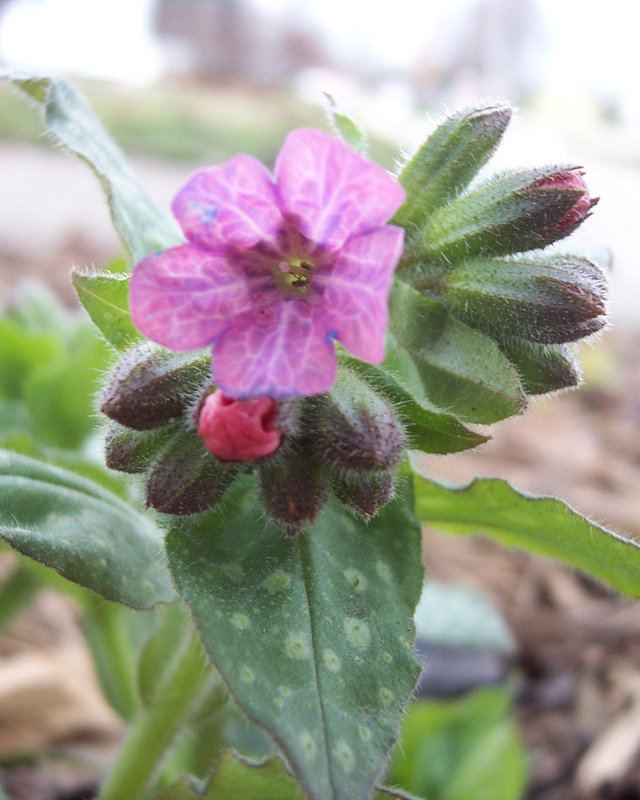 The bi-colored look makes Pulmonaria flowers seem to glow, lighting up a shady spot. Different cultivars have different flower colors ranging from light blue to raspberry. Some Pulmonaria will become large plants (if not tall ones) with a wide spread. ‘Mrs. Moon’ is one such plant. I planted young plants close together and found myself having to divide them the following season because they’d sprawled so much. Be sure to give them their recommended space. And if you do find them spreading out, dig and divide them in the fall. The bonus is that you’ll have more plants to either spread around your garden or share with a friend!